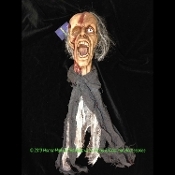 Shriveled and shrunken, partially decomposed dismembered Gory HANGING HEAD with OPEN MOUTH... This poor guy is screaming in horrible agony! Scrawny, tortured, life size cut-off head is hollow hard plastic vinyl. His mouth is open, displaying a painful wailing expression, featuring detailed, hand painted decaying teeth, and rotting flesh partially torn away revealing his skull bone. Some ghastly evil event has also caused him to lose one of his eyes, revealing an empty socket! Top of head to bottom of chin, approx. 8-inches (20cm). Top of head to base of detached neck, approx. 10.5-inches (26.25cm). Silky Gray Hair and ragged cloth attached. Top of head to bottom of cloth measures approx. 29-inch. *If you require delivery to a P.O. Box, you must pay for surcharges as listed, or your order may be delayed until surcharge fees are received, or physical address is provided.